The new kid on the iWork block is back for more. Numbers is the equivalent of Excel in Microsoft Office – a spreadsheet package designed to make working with figures and then presenting the results a doddle. The differences between Excel and Numbers reflect their ages and intents. While Excel is a powerhouse of readyreckoning, with presentation as an afterthought, Numbers is an offshoot of Keynote, where presentation is everything. So it won't come as a surprise that most of the new features in this second version of Numbers are to do with presentation. This isn't necessarily a bad thing, since anyone who's ever used Excel knows that its graphics capabilities are lacking. While most of the interface remains identical to iWork '08, there are another eight new templates to choose from. While these are stylish, their usefulness is debatable and show minimum 'translation' from the American originals beyond switching £ for $. The other immediately obvious change is the ubiquitous iWork '09 Share menu. Here, the old Send to iWeb and Export commands make their way over to join the new Send via Mail and iWork. com-related commands, Send via Mail being a simple way to email your spreadsheet in Numbers, Excel or PDF format. Where you'll find the biggest changes is in 2D charts. Now you can combine line, column, and area series in a single mixed chart; create two-axis charts with different value scales; and apply trendlines and error bars – nothing revolutionary compared to Excel's stats-mad powers, but a welcome addition nevertheless. Also in the "you've seen it somewhere else before list", charts and tables are now embeddable in Keynote presentations and Pages documents using simple copy and paste. Spreadsheets can be a pain to navigate as they get larger, with things like split screens and pane-freezing doing little to alleviate the misery in any program, but Numbers' new categorisation functions in tables are welcome. You can now group rows into categories, with each category including a summary row. You can use this to collapse, expand, and rearrange the categories. You can also add functions, such as subtotals and averages, to each row. It's all been seen before but is useful nonetheless. More innovative is the Formula List view. 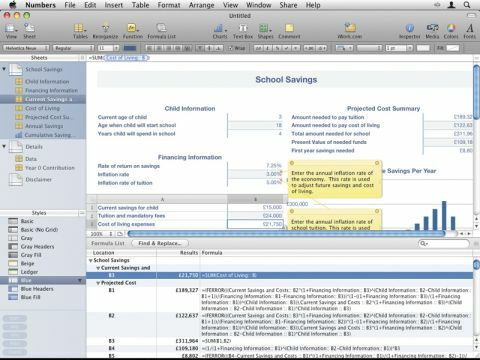 This adds a pane to the window with a list of calculations performed by the spreadsheet making it obvious what's happening. You can find and replace values and formulae in the spreadsheet, or click on anything dubious and be taken to the right cell to fix it. Fortunately, Apple hasn't forgotten that there might be some users who want to use Numbers for more than checklists and home inventories. It's more than doubled the number of calculation functions in Numbers from 100 to more than 250 – not quite up there with Excel's, so if you're a big fan of financial functions like COUPNCD, prepare to work them out from scratch, even on spreadsheets you've imported from Excel. More importantly, Apple hasn't ignored usability while adding this power. The formula browser now gives you a far greater explanation of what each formula does and you can add placeholder values for variables to give you a better idea of what happens. There's now enough power in Numbers '09 that only the real number-cruncher will feel short-changed by it. It's still something of a slacker when compared with Excel. But even the worst chart it ever produces is still going to look better than Excel's best efforts.